February 12, 2008 I stepped on to a plane bound for Krakow, Poland without any CLUE as to what God had in store for me. He knew. Mel and Dave asked if this was where God was calling me and for how long. I asked how long other people commit to when they move here. 2 years. I had no idea what I was saying, "Great, then I'll do 2 years too." He knew. I had no idea what the culture was going to be like, how cold the winters would be, how dark the days become, how rare some vegetables are to find. He knew. He knew the hardships, the seasons of loneliness, the depths of intimacy and vulnerability. He knew the place that I had just walked through with wounds and scraps and a bleeding heart, and He knew where He needed to take me. My God knows me. And He knows my absolute confidence when I say that my life, my heart, have been utterly transformed because of this crazy leap I took almost 5 years ago. I sit here with tears streaming down my face because I am in awe of the privilege I have been afforded to share life and ministry with the Josiah Venture family. For whatever hardship I have experienced, it is easily eclipsed by the glorious glow of relationships within JV, the experience of working alongside churches, ministries and in homes, and the joy of seeing a lost heart being made alive in Christ! Oh the joy of our lives that we get to live! The past 4.5 years have been cherished days, and God has given me every reason to continue to trust Him and His plans for me. And with that confidence, I know the next step He is asking me to take. It feels like I'm taking another crazy leap, but man....if it could be anything like this last season...I'm taking a running leap!! !I know that my season here in Europe with Josiah Venture is coming to an end and I will be moving back to the US the first part of January. I know that this is a good move for me, and I'm incredibly excited about what He has in store for my future. But when it comes at the cost of having to give up the privilege of living life here...it hurts. This place, this family, this ministry has become home. It's hard to leave home. But I look ahead to the family that I have back in the states. The richness of relationship, the community of beloved people who have taken this journey with me. You, who have faithfully and generously supported me in finances and prayer, God has used you so powerfully to bear witness of his greatness and love in my life. I look ahead to the opportunity to tell you this face to face but for know I say, simply and from the bottom of my heart, thank you for everything! There are so many things that I want to say, holes to fill in, reasons to explain, but I think for now I'll leave it here. “Can you come and share your story?” said Laura Hash, JV missionary in Poland. So it’s no joke or secret that I’m not a ‘wintery’ person. I mean, shoot, I was planning on moving to Africa before I moved to Czech. I can guarantee that their winters are better then anything in stock here. And by ‘better’ I mean NO SNOW! People have kind of snickered or laughed politely when I say that I don’t like snow. But I’m not trying to be funny. Let me be specific, because I’m not talking about large open fields with crystallized trees in the distance and enough thaw to hear the babbling of the nearest brook as the sun rises in the distance. I am talking about the snow that is slushed around and mixed with dirt and rocks to prevent slipping and then dogs (and some humans) feel the need to ‘doodle’ or toss their cigarettes, soda bottles, candy wrappers, receipts, used sausage plates with leftover mustard into the drifts. So there is a certain irony of being asked to come to a snowboard camp, emphasis on the s n o w. I grew up within 45 min. of Mt. Hood (gorgeous mountain in Oregon) and have only been skiing once in my entire life. Nothing like a barney-purple-full-body-bell-bottom-snow-suit to send all those snow-studs into a frenzy when I was 12! Fortuitously I wasn’t asked to come as an instructor, but as someone with some experience with life on the road with tours. Most specifically I was coming to their So You Think You Can Dance Night. The Polish version, You Can Dance! has become quite popular in the past couple years and they were having a theme night and dance competition. I use the word competition loosely. That was two years ago. Forgiveness has been freely given by my gracious and loving God. I saw a picture of what grace is and the value of such a cost to my God. I like the picture that Deitrich Bonhoeffer draws in his book, Cost of Discipleship, cheap vs. costly grace. The essence of cheap grace is that the account has been paid in advance; and, because it has been paid, everything can be had for nothing. I walked around after tour, and that place of such spiritual darkness, feeling guilty for smiling. You may think that’s silly and stupid. But honestly, I felt a great sense of guilt and shame from my choices and I didn’t want anyone to think that I quickly and flippantly moved on with my life. I didn’t want to feel like I did that. I needed to feel and taste this place of saddening separation from God. I didn’t want to find myself here anymore. For the past two years I haven’t been set free. It’s been a theory or wishful thought, not the reality of my heart. And as I stood in front of a room packed with 80 snowboarders I shared my story. At times my story is a comedy, I was actually capable of sinning? Get outta here! Me? Ba dump ching! I climb to the top of a mountain and do a Maria Von Trapp twirl as the music swells and my heart overflows with joy and relief. I close my eyes and and lift my face to the sky, letting the sun warm me. “I am FREEEEEeeeeeee!” I shout to the ends of the earth. Of course I assumed that my story was made into a movie, albeit a made-for-tv-after-school-special! I had fun. It’s sounds weird and maybe a bit disrespectful with such heavy subject matter. But I stood in front of those kids and talked about my crap and God’s redemption and I had fun. It brought me joy. Because I got to talk about my God, my Savior, my Jesus. What a privilege! I think God brought this up and used it to heal me, to get me across a threshold that I have been stuck behind. You may be reading this with a smile, reminded of your own epic and wonderful story of redemption. But if you are reading this wondering what forgiveness feels like from your creator God I want to invite you find your answer. Be free! Christ has set us free to live a free life. So take your stand! 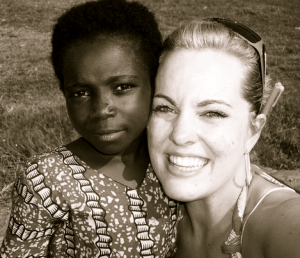 The Reluctant Missionary | Why Am I Reluctant? I didn’t use to be. In fact when I was a little girl being a missionary was all I thought I wanted to do, besides being a flight attendant so I could visit Disneyland more often. I would listen to other missionaries when they would come back from the field and share stories of transformation, faith, and a powerful God. I wanted that. I would cry because my heart would be so moved. I would insist that God was speaking to me on behalf of our entire family and tell my Dad that I thought we should move to Africa. My father would only wisely respond that he would wait for the Lord to confirm that to my parents as well. The passion to go was still there. As I stood in Starbucks waiting for my drink tears would run down my face as I read the front cover of the New York Times about war, poverty and lives that endured devastating trauma. I wanted to do something. To be something more than just the girl that read about it while she waited for her overpriced and too important drink. I wanted to go. This belief system became the philosophy of my heart. I continued to stay silent, I was just the ‘good girl.’ A memory that stings even to this day is when I was studying Spanish in Buenos Aires for a month. I had spent 8 hours a day with my small class of students from England, Holland and Germany. One of the last nights we were all sitting around a table and a conversation about God started. I made a comment that identified my beliefs as a Christian and my two British friends stopped in their tracks. “Are you a Christian?” asked Catherine, with her wine glass frozen midway to her mouth. “Yeah, I am” I shrugged and immediately felt exposed, afraid that I was going to have to pull out my Bible for spontaneous sword drills that I was probably going to fail! “Huh. I thought you were Buddhist or something.” And then the conversation was over. They continued on with their dinner and laughter and didn’t give two shakes that I was sitting in shocked silence. They thought that I was Buddhist? How could they think that? How could I live with people for a month and no one know who I am? How could people not see it, know it? I was panicked. Who was I? I continued to live my life as the ‘good girl.’ I was working in a pretty secular world and compared to everyone else I was the prude, conservative, straight-laced, nice, clean girl. Unfortunately, that doesn’t save us from ourselves. My will became weak and I let down my guard. My years of silence had manifested in me a silence of my beliefs and heart towards the Lord. When push came to shove I fell over. Consumed in a very dark world with my choices suffocating me I quickly became a woman that didn’t recognize herself in the mirror. A woman that didn’t know how to get back to any place that was safe or familiar. I couldn’t fathom how anything I had done could ever be erased from my face, my heart, my life. The forgiveness of the Lord was too good for me, I didn’t deserve it. And I didn’t think that I knew how to ask from this new place of sin. It was at this point and at this time that God wanted me to be a missionary. Are you laughing yet? Man, I sure was – kind of hysterically actually. If ever there was a time when I was not prepared, not willing, not even in the game – it was then. God brought me to this position with Josiah Venture on his design. Not at all by my doing or desire. I had been preparing to move to Africa to work in humanitarian aid for ten years, without a thought for the people or the work in Eastern Europe. It truly was all by His hand that he moved me to the Czech Republic and provided all that I needed financially to work here. I was lost, a wayward daughter of the King. And he brought me out of my miry clay and set my feet upon a rock. OH my God is so good and kind to me! There are days when I still feel like I was hustled in the back door. Like I want to slap myself in the face and remind myself, “Get it together! You’re a missionary now!” I still struggle with feeling worthy of sharing the Gospel with people. But then…then there are days when God gives me glimpses of who He is. A verse, a song, a prayer to reflect the glorious saving beauty of my Lord! I am lost in Him and lose my inhibitions and want to shout it from the rooftops that My God is Faithful! My God sacrificed his son for my sin! My God is the one true God! My God is glorious! I guess you can imagine why Paul is one of my favorite heroes of the Bible. Man if that boy had some baggage to bring to the fellowship hall, whew! And yet his story is magnificent because God used him so mightily to proclaim the saving Gospel of Jesus. Why can’t God use me like that? Do I dare stand in the way? I didn’t plan to be a missionary. If I’m honest I was scared out of my ever-lovin mind to accept this invitation. But I came, reluctantly. God is reawakening that little girl’s heart in me. That place of childlike passion for her King. My God is so good. Is yours?